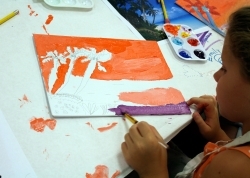 Our summer programs welcome children ages three to twelve in classes designed to engage and build skills in the visual arts. We offer a three day morning art program for children aged 6-12 Artful Mornings, and a once a week pre-school art program 'Tute for Tots. All workshops meet in the art studio. Your child must be accompanied by an adult to and from the studio. Doors to the classroom typically open 10 minutes before the program begins. A sign in and out sheet will be at the front desk for you to check your child in/out. Please pack a snack for your child. We will provide bottled water. or contact the Education Department at 518-463-4478, or email waldronv@albanyinstitute.org.